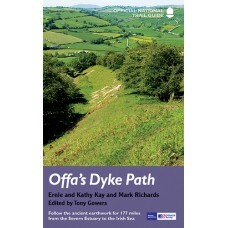 This guide covers the 177 miles (285km) of the Offa's Dyke Path (Gogledd Llwybr Clawdd Offa), which, as it follows the undulating borderlands of England and Wales, passes through a stunning and ever-changing landscape. Starting at Sedbury Cliffs on the Severn Estuary, the guide follows the Path up the wooded slopes of the Wye Valley and along the splendid ridge of the Black Mountains to Hay-on-Wye, famed for its numerous bookshops. Beyond the hills on the Shropshire-Powys border lie the lowlands of the Upper Severn Valley, giving way to more dramatic scenery as the route approaches Llangollen and the World Heritage Site of the Pontcysyllte Aqueduct. The final stretches of the Path take take in the rugged beauty of the Clwydian range with its fascinating hillforts, before making a last plunge to the Irish Sea coast at Prestatyn.